Morgan Hollie was a Global Studies major at the University of Illinois at Urbana-Champaign, majoring in Biology and minoring in French, when she wrote this blog entry in the EUC sponsored ‘Language and Minorities in Europe’ course in the spring of 2013. Zsuzsanna Fagyal-Le Mentec is an Associate Professor at the University of Illinois at Urbana-Champaign. map). Rather than calling it an immigrant language, however, the famous report The Languages of France, compiled for the French government by the linguistic historian Bernard Cerquiglini in 1999 called this type of Arabic a “non-territorial language." Other languages, such as Berber, Armenian, Yiddish, and Romani, have also received the same label in the 1999 report, meaning that these are languages that originated outside of France and have been spoken and transmitted by residents and citizens of France for several generations. This variety of Arabic in France shows a lot of different influences (words and expressions) coming from different countries or regions of the Maghreb” (Caubet). 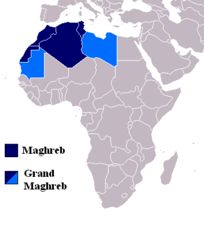 As Arabic is an umbrella term for a language with many distinct, often unintelligible dialects, it is important to distinguish that components of Maghrebi Arabic originate from part of North Africa comprised of Morocco, Algeria, Tunisia and Libya. Maghrebi Arabic is the most widely spoken and transmitted variety of Arabic in France, a reality that reflects the nation’s colonial history. Morocco, Algeria, and Tunisia all have long colonial histories with France, achieving their national independence in 1956, 1962 and 1957, respectively. French colonial exploits in these areas were marked by the promotion of colonized lands in North Africa as the “other,” which would later develop into the paradigm known as Orientalism. The concept of Orientalism typifies Middle Eastern and North African cultures as barbaric and undeveloped through a lens that likewise characterizes Western ideals as standard and proper. Such ideas of cultural inferiority served as justification for European imperial exploits in lands they previously held no claim to. The concept of cultural inequality combined with the notion of the Middle East as the Orient allowed for the construction of a cultural other whose exploitation was marketed as both fiscally beneficial to the colonizing state as well as necessary to civilize the natives that were perceived largely to be barbarians. (Said, 1979, 92). This attitude towards the Middle East and Islamic peoples continued throughout the twentieth century and was mostly spurred by Europeans until the onset of World War II. It is shorty after this time, after the former North African colonies realized their independence that an influx of North African immigrants begin to make their way to France, bringing with them their mother tongue that yielded, over the long run, Maghrebi Arabic. Having such a language in a country where immigrants started arriving many decades ago means that the language is still transmitted today. So, how many speakers of Maghrebi Arabic are there in France? There is no simple answer to this question. France country’s census has been notorious to not collect information about racial or ethnic origins, including mother tongue. A 1951 law and its 1978 version, more adapted to the digital age, explicitly forbade collecting and storing public statistics on French citizens’ ethnic/racial origins, political, philosophical or religious view and opinions. 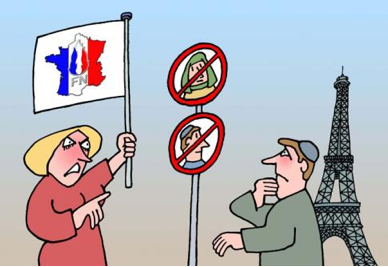 Therefore, it remains difficult to estimate how many Arabic speakers are in France altogether, which also complicates the challenge of assessing the needs of various ethnicities in France. However, there have been changes recently in ethnic polling in France. The 1978 law created an independent commission that oversees matters of discrimination in many domains of the media and information, called the CNIL (Commission Nationale de L’Informatique et des Libertés). Since 2011, with permission from this commission, it is possible to collect, analyze, and publish information about ethnic origins of French people if the poll or the study is concise and guarantees the strict anonymity of its respondents. Thanks to this special permission, results from studies like the TeO (Trajectory and Origins) project, headed by a team of social scientists, were published recently. When it comes to immigrant populations in France, it appears that in 2008, out of the 8.4% of France’s population that was of immigrant origin, 35% had at least one parent, but often two, born in the Maghreb. This could be, in principle, good news for the transmission of Maghrebi Arabic and could explain how this variety of Arabic could be transmitted by families. Caubet estimates in 2004 that “between 2.8 and 3.5 million people in France [are] originating from the three countries." She cites a study from 2002 that looked into language minority transmission in a small number of French families and estimated that a little less than 1.2 million speakers “received Arabic from their parents." Despite the high numbers of Maghrebi Arabic speakers in France, the language receives no official recognition at the state level. The optional test in ‘arabe dialectal’ at the all-important Baccalauréat (high school exit exam) was first transformed from an oral exam into a written exam – not exactly favoring a spoken language – and then terminated in just a few months in 1999. Another important point is that Maghrebi Arabic is spoken by a segment of the French population with relatively little influence and a great deal of social stigma. At the constitutional level, the only language recognized by the French government is French. There have been efforts on the part of representatives for regional minority and immigrant language to amend article 2 of the constitution, which states “the language of the Republic shall be French” (French Constitution, Art. 2), to recognize minority languages as well, and some concessions have been obtained. By and large, however, even today, immigrants from the Maghreb must content with monocultural social convictions and enforcement of French as the national language (EBLUL France). It is difficult not to see in this situation remnants of French cultural superiority that are a heritage of the French colonial assimilationist model. French efforts to “assimilate colonial subjects through French language and culture” have had a lasting effect on attitudes towards immigrants in France today (Bleich, 2005, p.174). They had repercussions on language attitudes, as well. Because of the pressure to self-incorporate with what is thought of as French national culture, members of the Maghrebi immigrant community often experience shame of their mother tongue. “Codeswitching is very common in these bilingual communities...” (Extra, Gorter) and is often perceived negatively. “How can these attitudes be described? Is it “lack of self-esteem” or only linguistic insecurity? D. Caubet asks, as well. “What is certain is that the lack of valorisation of the family language and culture can lead to serious disturbances.” Nonetheless, “never has arabe maghrébin been written so intensively, by millions and in latin script, both in the Maghreb and in Europe”, she argues, which might eventually help the status of language. France. Theory and Society, 34, 171-195.
la Culture, (2003) Les Langues de France, Paris, PUF. Constitution of October 4, 1958. French National Assembly. French National Assembly, n.d.
Educational Perspectives. Clevedon, U.K.: Multilingual Matter, 2001. Print.